Whimsical Weirdness and Foolery / The WW&F and Boothbay Railway Village announce "The Narrow Gauge Connection"
Fresh off their unprecedented Narrow Gauge Collection collaboration with Maine Narrow Gauge Railroad and Museum, the WW&F is pleased to announce today the Narrow Gauge Connection which will build 14.5 miles of new track between Sheepscot Station in Alna, Maine to Boothbay Railway Village in Boothbay, Maine. "The all-new route is a stunning display of narrow gauge theory," gushed WW&F Superintendent Jason Lamontagne. "It features seven sweeping S curves and a spectacular new bridge over the Sheepscot River. Folks will come from all over the world just to marvel at how the trains navigate the terrain." A map of the route is shown below. Moreover, this route bypasses the tourist mecca of Wiscasset, instead drawing visitors to Alna, Edgecomb, and Boothbay. It is expected that the line will attract those commuting to Edgecomb from the north and south. Both of Edgecomb's residents are very enthusiastic about the prosperity the narrow gauge promises to bring to the town. No longer will visitors to Boothbay Railway village be limited to a trip around a short circle of track. Instead BRV's collection of historic stations and structures will be relocated throughout the route. "The possibilities are dizzying", said one BRV representative. Because the route does feature some significant grades, a new class of narrow gauge locomotive will be constructed as part of this collaboration. The 4-8-8-4T "Little Boy" class will be the largest 2ft gauge locomotive ever built. Essentially a scaled down "Big Boy" (made famous by the Union Pacific), the "Little Boy" will have an attached coal bunker and large water tank over the boiler. The Union Pacific railroad is sponsoring its construction, and will assist with the project under the condition that it be painted armour yellow and feature a large UP shield on the smokebox. The funding for the Narrow Gauge Connection is being provided by an anonymous rich guy who likes trains. He owns a small island off the coast of Maine and has frequented both the WW&F and BRV. "It has long been my dream to connect these two attractions", he stated. "Now I will be able to travel freely between them, avoiding the traffic going to Maine Botanical Gardens." Mr. Joe Fox, who will be required to maintain the nearly 20 mile railroad, was unable to comment in a manner suitable for inclusion in this press release. I created a sub-board under "Volunteers" for Car Hosts. This will be an area where those volunteers who are Car Hosts, Docents, Tour Guides, enthusiastic Brakemen/Conductors, etc. can share resources, tips, etc. All existing operating personnel are already members of this group and should be able to access this section of the Forum. In doing so, I grouped Operating Volunteers and Carpooling as "child" boards to Volunteers. I think this tidys things up a bit; matching the Members-Only sections of the Forum. If you want access to the Car Host section, (you are planning on training as a Car Host) and do not have acess already, please let me know. Sonja has informed me that all accommodations in the Percival House for the Spring 2019 work weekend have been claimed. Those seeking a place to stay are reminded that the Wiscasset Woods Lodge is open. Personally, I have found reasonable accommodations using Airbnb, as well as hotels in Brunswick. Today, the Emery Rail Heritage Trust (http://emeryrailheritagetrust.com/) announced that the WW&F is receiving a $8000 grant to be used towards the completion of the Mountain Extension. This is the third (and largest) formal award the ERHT has bestowed on the WW&F towards our continued expansion of mainline trackage over the last five years. We are grateful for this grant, and appreciative for all that they do to help fund the preservation of our rail heritage. 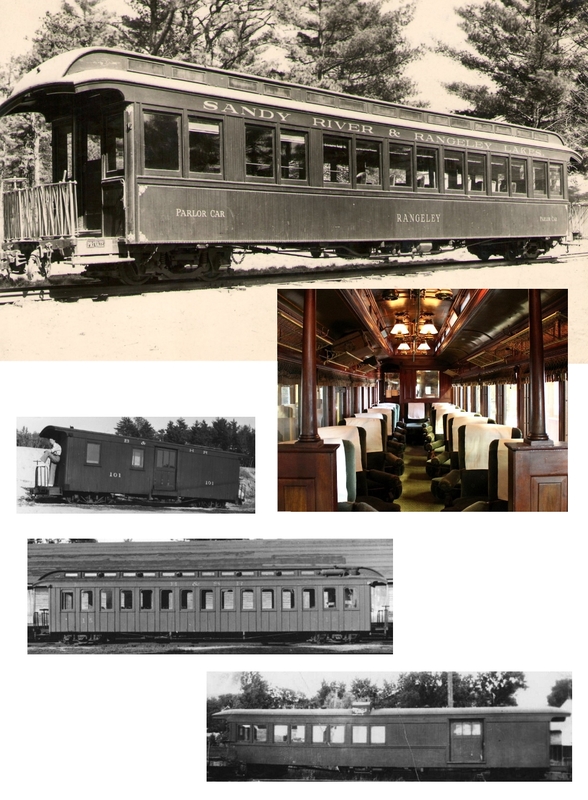 The collaboration will see the Maine Narrow Gauge Railroad's core collection, including the Rangeley, the only two-foot gauge parlor car ever built (above), moved to the WW&F's Sheepscot Station campus in Alna. There, an enhanced exhibition facility will include enhancements to existing structures to provide additional exhibition and display space and better visitor facilities. The Maine Narrow Gauge Railroad will continue to operate its vintage 2-foot gauge trains along the Portland waterfront, with a track lease that has been extended to 2039. In addition, the WW&F is pressing forward with its ‘Mountain Extension’ project, a multi-year effort to re-lay track on three-quarters of a mile of the original WW&F Railway's grade - a scenic descent of a mountainside that brings the railway to the former Boston & Maine Railroad Howe pony truss bridge, installed by the museum over Trout Brook in 2018, and beyond to a new station adjacent to Maine Route 218. To support this effort, the WW&F is the 2019 recipient of the $10,000 H. Albert Webb Memorial Railroad Preservation Award. Dave Buczkowski and Ed Lecuyer of the WW&F, along with Wesley Heinz and Jerry Angier from the MNG, will give us an update on these exciting developments, how they came about, and what the future holds for these two pillars of Maine narrow gauge railroad preservation. We look forward to seeing you in Malden! Garage parking is available just north of the restaurant on Summer Street. Pearl Street Restaurant is just a short walk from the MBTA Orange Line & Commuter Rail Malden Center stop. RESERVE YOUR SEATS TODAY! Dinner reservations limited to 56 guests! Additional seating will be available for guests who wish to attend the program without attending the buffet dinner. Mass Bay RRE members will be given preference for dinner & seating reservations through March 23, 2019. Buffet Dinner: Mass Bay RRE Members $35. Non-members $40. Museum Discussion / THANK YOU, LEIGH WEBB AND THE MASS BAY RRE! 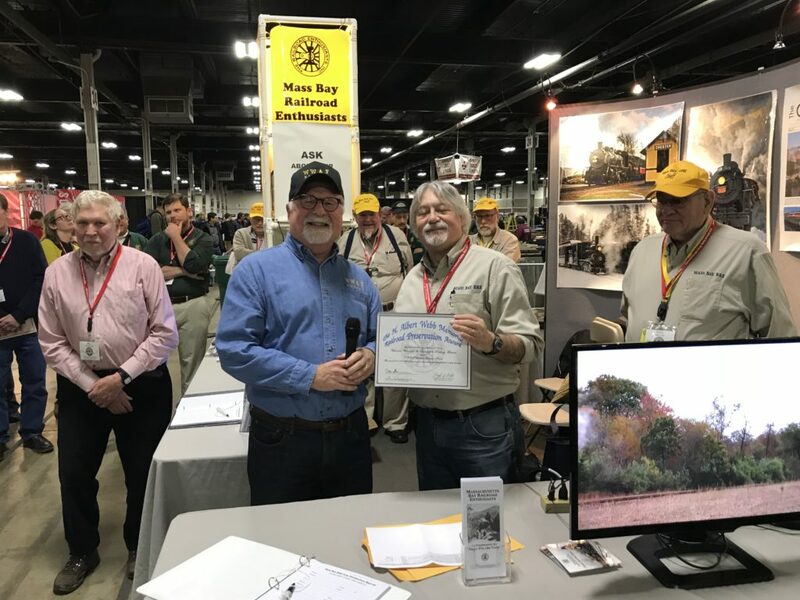 On Saturday, January 26, 2019, at approximately 2:24pm, the Massachusetts Bay Railroad Enthusiasts announced our Museum is the recipient of the 2019 H. Albert Webb Memorial Railroad Preservation Award to support the purchase of track materials and labor for our Mountain Extension project! The Maine Narrow Gauge Railroad "Core Collection" is defined as: Parlor Car Rangeley, and combination car 14 both from the Sandy River and Rangeley Lakes RR and coach 16 Mt Pleasant, and caboose 32, both from the Bridgton & Saco River RR. "Other select artifacts" include Locomotive 8, plow 2, & tank car 14, all from the B&SR RR. The "enhanced exhibition facility on the Sheepscot Campus" includes enhancements to existing structures to provide additional exhibition and display space and better visitor facilities. Look forward to jointly-produced events which highlight the partnership and utilize this equipment for unique operational opportunities on the WW&F. Directors from Maine Narrow Gauge Railroad Co. & Museum and the WW&F Railway Museum met at the Head Tide home of Gail Ciampa and Dave Buczkowski January 12th to finalize the details of the Narrow Gauge Railway Collection collaboration. 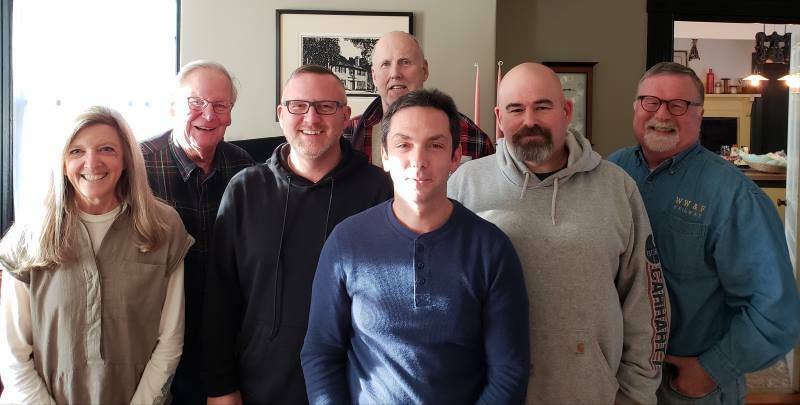 Pictured (left-to-right) are MNG Secretary Catherine Geren, MNG Trustee Jerry Angier, MNG Executive Director Wesley Heinz, MNG President John Marr, WW&F Director and Superintendent Jason Lamontagne, WW&F Director Brendan Barry, and WW&F President Dave Buczkowski. Photo by Gail Ciampa. Arriving Friday 1/25 at 2:24 - a special announcement regarding the future of Maine's narrow gauge past. Photo courtesy of Stephen Hussar. Museum Discussion / Article on Trains website: "An Appointment with Number 9"
I'm not sure it's been posted on the Forum, but we are having FOUR days of "Steam and Sleighs" this winter. Dates are Jan 19 & 20, and Feb 16 & 17. Please come out and enjoy the Winter Weather and Fun! Museum Discussion / Steam Trains 2019 Calendar Features WW&F. 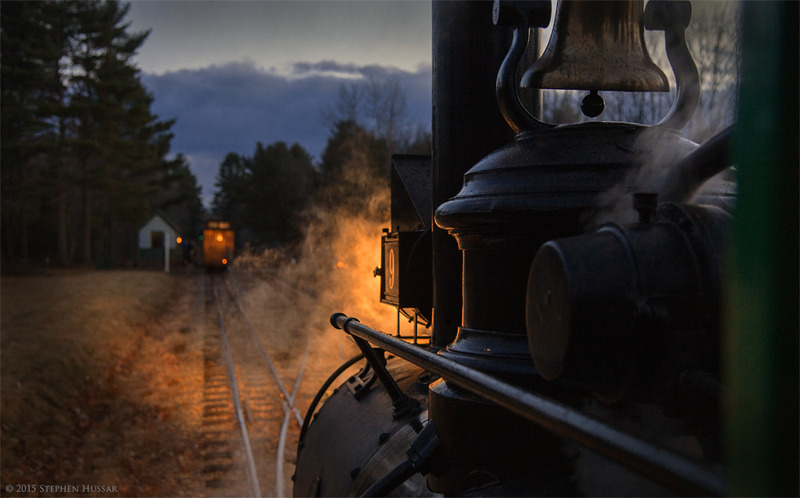 While we are always partial to the museum-produced calendar featuring Stephen Hussar's photographic artwork, Kevin Madore's work is nationally-distributed as "Steam Trains." For 2019 (as was in 2017 and maybe others) one month includes a shot of the WW&F. This time, a winter photo of #9 taking water at Sheepscot. Thanks Kevin for the national exposure! The WW&F was honored directly and indirectly by two different awards bestowed by the HeritageRail Alliance at their Fall convention. The Significant Achievement Award-Structures recognized the saving, reconstruction, moving and placement of the former Boston & Maine Moose Brook bridge onto the WW&F at Trout Brook. The WW&F also accepted a Friend of Railway Preservation Award on behalf of the Ramsdell/King family, who over three generations saved WW&F locomotive #9 from the scrappers torch. Our own Jason Lamontagne was on-hand to receive both awards.